At first glance a couple things are off about this tweet, admittedly minor, but worth noting nonetheless. 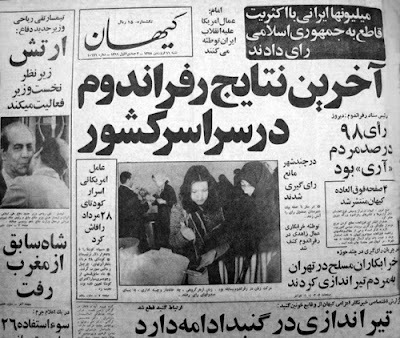 For one, the photo used in the tweet - taken by AP photographer Aristotle Saris, was taken not on "This Day in History" back in 1979, but actually on January 19 of that year, at a massive, million-plus person, pro-Khomeini rally against the government of the recently exiled Shah and in favor of the establishment of an Islamic republic in its place. Also, "This Day in History" is actually yesterday. The advent of an Islamic republic in Iran was announced by Ayatollah Ruhollah Khomeini on Farvardin 12, a date on the Iranian calendar that corresponds with April 1, except in leap years, when it's March 31. This being 2016 - a leap year - CFR should have posted the anniversary tweet on Thursday, not today. More importantly, however, the language used in the tweet's text is somewhat misleading. Of course, tweets are, by design, extremely limited in content - not too much context is possible in a mere 140 characters. Still, completely omitted from this quick retrospective is the fact that an Islamic republic replaced the Pahlavi dynasty - and with it millennia of monarchy - through the will of a popular referendum, not merely imposed by dictatorial mandate. Just days after returning to Iranian soil after years of exile, Khomeini appointed Mehdi Barzargan as prime minister of the interim government. In a statement read by none other than Hashemi Rafsanjani, who would go on to become (and remain) one of the most powerful political forces in the country, Barzargan was granted not only "the authority to establish an interim government without consideration of any affiliation to parties or dependence on any factional groups," but also to arrange "a referendum and refer to a national public vote the issues of turning the country into an Islamic republic." 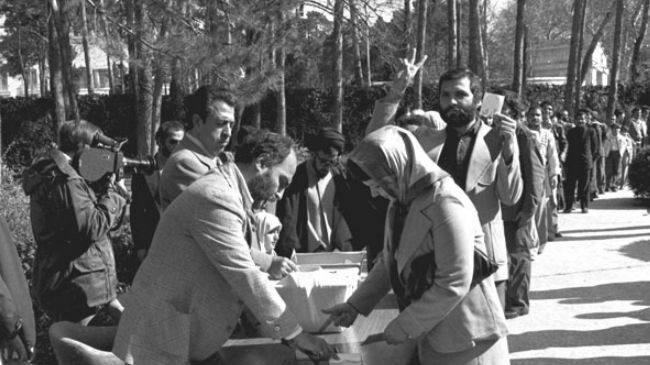 Less than two months after the Shah was deposed, a referendum vote took place in Iran (and at Iranian embassies and consulates worldwide for Iranian citizens in the Diaspora) on March 30 and 31, 1979 to determine the future nature of the nascent post-revolutionary government. Over those two days, millions of men and women, 16 years of age and over, cast their votes. Perhaps the outcome was never really in doubt. 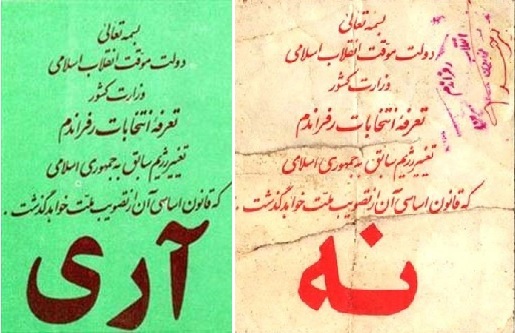 Placards and posters depicting Khomeini and the admonition, "Only an Islamic republic," were ubiquitous. An Iranian political economy professor, writing from Paris the day before the vote, noted that the "majority is expected to vote for replacement of the monarchy by an as yet undefined 'Islamic republic.'" A number of political and ethnic minority groups around the country boycotted the referendum on the reasonable grounds that not enough choices were presented to the electorate. The ballot came in three sections, like a perforated ticket. One section was for registration, the other two were the choices: the section in green, the color of Islam, had the word "yes" printed on it; the other was red, with the word "no." ...the voters presented a birth certificate or other identification, had it stamped and took the ballot, which was stamped again on the registration section. They would tear off either the green or red section and deposit it in a box on the table...The unused section of the ballot could be discarded or carried away. The article also notes that, at that particular voting station, a precinct election judge "showed a visitor a wastebasket at the polling place at midday to indicate how the returns were going. Nothing but red 'no' slips could be found among the hundreds of crumpled papers." There were many reports of polling officers tearing off the green-colored "yes" portions of the ballots and stuffing them in the boxes on behalf of the voters, who meekly got their identification cards stamped and left. A number of young voters told reporters that they were afraid to openly vote no in the presence of so many others who felt otherwise. On April 1, 1979, the result was announced. New York Times reporter Gregory Jaynes wrote that "Ayatollah Khomeini was jubilant over the two-day vote on his proposed Islamic republic," quoting the revolutionary leader's published statement: "I am declaring today the day of the Islamic Republic of Iran, and I would also like to declare that such a referendum is unprecedented in history - to establish a Government of righteousness and to overthrow and bury the monarchy in the rubbish pile of history." As for the turnout and resulting percentages, Jaynes reported that the referendum commissioner Ahmad Noorbaksh said that "97 percent of the electorate had voted for the Islamic republic, out of the 98 percent eligible to cast ballots," though this was an unofficial assessment. Official results would not be released for a few weeks. "The form of government of Iran is that of an Islamic Republic, endorsed by the people of Iran on the basis of their long-standing belief in the sovereignty of truth and Qur'anic justice...through the affirmative vote of a majority of 98.2% of eligible voters, held after the victorious Islamic Revolution led by the eminent marji' al-taqlid, Ayatollah al-Uzma Imam Khomeini." It has subsequently been reported that the total number of voters was 17,129,896. Of those, a reported 16,821,557 (98.2%) voted "yes" in the referendum, as opposed to the 308,338 voting "no." Another source reports, "According to published records in this referendum 20,288,000 people voted 'Yes' and 241,000 people voted 'No,'" while yet another claims that 20,147,855 voted 'yes' and 140,996 voted 'no." This figure puts the approval rate at 99.3% of voters. Overall, the voter turnout has been generally placed at 92%, though obviously this "official" number could be disputed. Nevertheless, with an "Islamic Republic" founded, Iran now needed a new constitution. The Ayatollah Khomeini regime unveiled a draft constitution on June 18. Aside from substituting a strong president, on the Gaullist model, for the monarchy, the constitution did not differ markedly from the 1906 constitution and did not give the clerics an important role in the new state structure. Ayatollah Khomeini was prepared to submit this draft, virtually unmodified, to a national referendum or, barring that, to an appointed council of forty representatives who could advise on, but not revise, the document. Ironically, as it turned out, it was the parties of the Left who most vehemently rejected this procedure and demanded that the constitution be submitted for full-scale review by a constituent assembly. After a month-long campaign, elections for this 73-member body - dubbed the "Assembly of Experts" - were held on August 3, 1979, and a new draft of the constitution combining elements of republican and clerical rule was hammered out by mid-November. On December 2 and 3, 1979, a second referendum was held to adopt the newly-written constitution. It is reported that the new Iranian Constitution was approved by 99.5% of voters (15,680,218 in favor; 78,516 opposed), with a 71.6% turnout. A newly created seventy-three-member Assembly of Experts convened on August 18, 1979, to consider the draft constitution. Clerics, and members and supporters of the IRP dominated the assembly, which revamped the constitution to establish the basis for a state dominated by the Shia clergy. The Assembly of Experts completed its work on November 15, and the new Constitution of the Islamic Republic was approved in a national referendum on December 2 and 3, 1979, once again, according to government figures, by over 98 percent of the vote. Obviously, this is too much information to summarize in a single tweet. But knowing the context is important, especially if we are to understand the revolutionary and political history of a nation that is all too often misrepresented, maligned, and marginalized in our own media.